Meet Mila Frei: a senior, single woman with a disability who lives in Cape Breton, Nova Scotia. She represents the many people living in Canada for whom the prohibitively high costs of health care mean choosing between wellness and making ends meet. On the other hand, she also represents the many seniors in Canada who have been helped through targeted anti-poverty measures. Mila struggles with mobility issues and chronic pain due to a car accident in her 20s. She is currently a benefactor of the Nova Scotia senior pharmacare program, with no annual premium due to her low income. However, this program does not cover physiotherapy, which her doctor has prescribed twice a week to help her manage debilitating pain. In addition to paying out-of-pocket for her physiotherapy, Mila also relies on prescription opioids and extra strength painkillers covered by her provincial pharmacare program. Because of Mila’s accident, she was unable to maintain steady employment throughout most of her working-age life. She is therefore ineligible for the Canada Pension Plan and has no retirement savings to supplement her Old Age Security, which has been her only source of income for the past 7 years. Mila’s financial situation improved, however, with the introduction of the Guaranteed Income Supplement for Seniors, a government transfer that makes up approximately 58% of her entire monthly income. For the first time in a long time, Mila can afford to take her grandchildren on outings and buy them birthday presents - things she had not been able to do before. This new capacity has helped her recover from feelings of shame and isolation from her family, as well as allowing her to buy clothing and miscellaneous items throughout the month. Mila’s situation is a great example of how targeted government policies can benefit particularly vulnerable groups. In recent years the federal government has taken steps to improve the quality of life for seniors by increasing the maximum monthly GIS benefit from $747.86 in 2014 to $876.23 in 2018 and lowering the age of eligibility for Old Age Security from 67 back down to 65. Improvements remain to be made, however, in ensuring that all those eligible actually receive these benefits. Mila is on a waitlist for subsidized housing but is concerned about health hazards associated with poor living conditions. She would prefer to remain in her one-bedroom apartment that she has lived in for the past decade because there are no stairs to contend with and it is near a grocery store and pharmacy. $3,931.40 below the poverty line (annual after-tax low-income measure). Nearly 15% of single elderly individuals and 23% of people with disabilities live in poverty. Seniors must still apply for the GIS in writing, which acts as a significant barrier for certain eligible seniors. Indigenous peoples, seniors experiencing homeless or near homelessness, and newcomers are disproportionately represented among those who qualify for GIS but do not receive it. While senior women’s average income has increased, the average income for senior women has remained 1.5 to 1.6 times lower than that of senior men. 1 in 10 Canadians cannot afford to fill their medical prescriptions. Canada is the only industrialized country with a universal healthcare system, but without a national pharmacare policy. In 2013, the Canadian Medical Association identified income, housing, nutrition and food security, and early childhood development as the four main social determinants of health, calling on federal, provincial, and territorial governments to give top priority to developing an action plan to eliminate poverty. Health and social well-being are very closely related to levels of income equality within rich countries. There is no such relationship, however, between health and social well-being and rich countries’ average incomes. In a country as rich as ours, it is unacceptable that 1 in 10 Canadians cannot afford prescription drugs. Add your voice to over 12,000 individuals, organizations, and government representatives who support Dignity for All’s comprehensive, rights-based anti-poverty plan. Together we can work towards a poverty-free Canada. 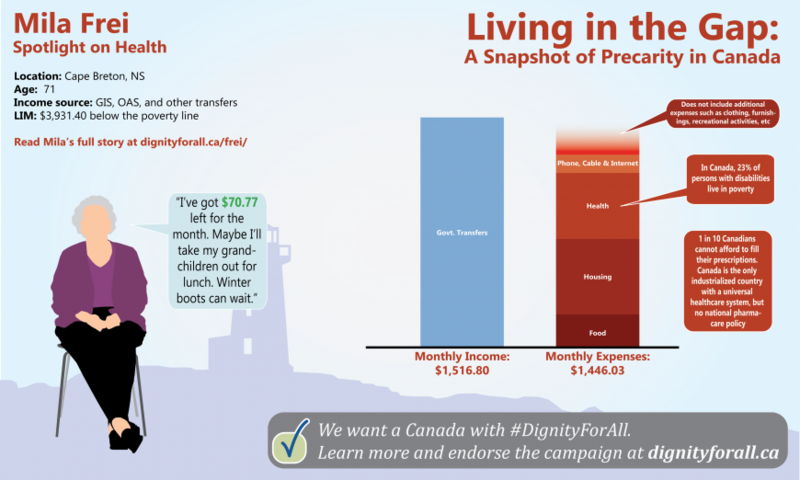 Check out Dignity for All’s one-pager on Health for more information on poverty and health in Canada.